Greetings again from the darkness. The tar pits of La Brea. Michael Corleone. These are the two things that come to mind as I grasp for descriptive terms to use for writer/director JC Chandor’s latest film. Picture a slow simmer never quite reaching the boiling point … that’s the designed tone here. It’s certainly not the period piece crime thriller that the trailer might have you poised for. In fact, there is more focus on marital communication than the criminal element so prevalent for the times. In 1981, New York City was in the midst of an era filled with crime, corruption, violence and filth. Enter Abel Morales (Oscar Isaac) as a tough-minded, but idealistic owner of a heating oil business. Abel’s vision is to become the top oil distributor, and remain a really good guy in the process. When he tells his less-idealistic competitors to “have some pride in their work”, it’s good advice to an audience incapable of comprehending. Despite regular violence and criminal activity against his drivers and trucks, Abel continues to deny he is at war … he truly believes if he can stay above the fracas, he can overcome the blight of his industry. We never really see Abel have a good day. Even the high points are paired with hard knocks. A signed contract is followed by bank woes. A kid’s birthday party at the new house is interrupted by a search warrant. New market share is offset by a driver illegally defending himself. Each step Abel takes to realize his business vision is a potential land mine set by either his competitors or an ambitious District Attorney (David Oyelowo). And those aren’t even his most animated battles. See, Abel has willed himself to extraordinary self-control. He never blows a gasket, even if the moment calls for it. The only exception to this is with his vicious business partner and wife Anna (Jessica Chastain). Anna grew up the daughter of a gangster … her dad once ran the business that she and Abel now run. Given the times, Anna takes a back seat to Abel and she handles the books, while he is the face of the business with banks, competitors and Teamsters. It’s not difficult to imagine a movie focusing on Anna rather than Abel, and a couple of times, she makes it quite clear that she views herself as the real backbone of the business – a much tougher leader than her doe-eyed husband. Isaac and Chastain are exceptional here, and they both pull off very tough roles. Abel is a philosopher is a world of barbarians. He is the most polite angry person you have likely ever seen. Anna, on the other hand, is the pretty face masking a ruthless gangster. They each believe their own way is the best way. When Abel explains that ‘The result is known’, and that there is only ‘one path that is most right’, we immediately know he believes this and lives his life accordingly. In addition to Isaac, Chastain and Oyelow, other actors deserve recognition for their work here: Albert Brooks is Abel’s consigliore, in a style reminiscent of his Drive character; Alessandro Nivola is the most frightening type of gangster – the quiet, powerful kind; Catalina Sandino Moreno (Maria Full of Grace) is outstanding in her only scene; Elyes Gabel captures the frustrated driver looking for hope; Peter Gerety is spot on as the Teamsters lead; and Jerry Adler is a most unusual Jewish business man. The camera work of cinematographer Bradford Young (Selma) helps make the style and story work. He films two of the most unusual chase scenes – one on foot across the highway, and another with a car and truck on railroad tracks and through a dark tunnel. Both are critical to story and character, and provide a stylistic flourish that pumps things up in a movie otherwise devoid of traditional action. The story is captivating because of things that are intimated, rather than things that are said. A couple of other films set in this era are Prince of the City and Serpico, and though the tone and look may be familiar, Chandor’s approach is unique. It’s not difficult to imagine Oscar Isaac took his acting cues from Al Pacino as Michael Corleone, and oddly enough, it’s possible to imagine him as Tony Montana in a Scarface remake! At the core of all of these characters … the American Dream. 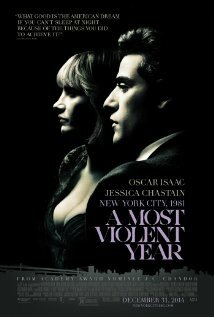 SEE THIS MOVIE IF: you are wondering if something is “disrespectful” … Jessica Chastain will let you know! Greetings again from the darkness. An art-house crime drama. That’s the best description I can come up with. Danish film auteur Nicolas Winding Refn takes the James Sallis novel and presents it like an art gallery opening … with operatic tendencies … and electronic music thumping straight out of the 80’s. Confused yet? My apologies, but I am trying to make the point that this one is different. No wonder it got such a strong reception at Cannes, where creativity has always been rewarded. Ryan Gosling stars as the nameless driver. He is a movie stunt driver by day and hired lead foot in his spare time. He partners with hustler Bryan Cranston (“Breaking Bad”) for the odd-jobs and they both dream of going straight by entering the racing world. To do that, they need a capital infusion from bad guy Albert Brooks. Yep, I said BAD GUY Albert Brooks. We all know Mr. Brooks as the wry comedian who makes us laugh at the world. However, trust me when I say he plays a really bad man. If you have seen Out of Sight, you have seen this side before. If not, you will be shocked. Gosling’s character is quite the loner, but he falls for his neighbor played by Carey Mulligan, who has a cute young son. Gosling’s dream of normal include not only racing, but also a domestic home life with these two. Small obstacle: Mulligan’s husband (Oscar Isaac) is getting out of prison in a week. When he arrives, Gosling agrees to help him square a debt with some bad guys. Things don’t go so well and Gosling’s dream of domestic bliss goes straight to Hades. Well, actually not all that straight. As they tend to do, the bad guys (including Ron Perlman) run a double-cross and things get really messy. The middle 60% of this movie is as intense and thrilling as you could ever ask. Some terrific driving stunts as expected, but also some very nice “little” scenes as these most interesting characters try to make sense of many tattered loose ends. Refn’s camera work and lighting are very stylish, providing a noir look and the perfect feel. My mind was racing as I watched this oddly paced, minimal dialogue, intense story unfold. A few films flashed in my mind and I have decided there are elements of each: Bullitt (1968, Peter Yates), The Driver (1978 Walter Hill), Thief (1981 Michael Mann), To Live and Die in LA (1985 William Friedkin), and Heat (1995 Michael Mann). Additionally, Gosling’s character shares some traits with Clint Eastwood’s ‘Man with No Name’. Now I am sure you are confused. How about one more: Gosling wears a jacket similar to Kurt Russell‘s Stuntman Mike in Death Proof, only this one has an embroidered scorpion and sure enough, we get the scorpion and frog story. Gosling gives a very solid strong, silent type leading man performance, and Mulligan has very little to do. Albert Brooks will probably get some well deserved attention at Oscar time. There are a couple of scenes that more and make this one worth seeing. One is the fantastic chase scene after the pawn shop robbery and the other is the most beautifully choreographed and violent elevator scene ever filmed, complete with mood lighting! This one will be loved or hated by those that see it. Hard to imagine it falling in the gray area. If you are up for a twist on the traditional approach to crime dramas, and can handle some brutal violence, I would encourage you to check it out. Greetings again from the darkness. I was excited to hear Dallas Morning News film critic Chris Vognar put together a monthly film series focusing on the 1970’s. The first showing was last night and, of course, I attended … Martin Scorcese’s 1976 film Taxi Driver. The biggest surprise of the evening came when Mr. Vognar asked for a show of hands from those who had not previously seen the film … approximately HALF admitted it was their first time. Now I have seen the film 12-15 times, and last night made the third time on the big screen – counting the first time which was at a Drive-In! The surprising thing about the first timers was that they were somehow drawn to it 35 years after release, but had never felt strongly enough to rent the video or include on their NetFlix list. Maybe it was the lure of the Q&A with a noted film critic or maybe they just wanted it in a theatre setting. Either way, it was very interesting to hear crowd reactions from so many who were witnessing the Schrader/Scorcese work for the first time. Whether you have seen the film or not, chances are good that you are familiar with the “You talking to me?” scene. Robert DeNiro improvised the scene including the key line “Well I’m the only one here.” That line goes straight to the theme of isolation and alienation that runs throughout. Another interesting aspect to consider is the similarity between this film and John Ford’s classic The Searchers. Both include no-holds-barred rescue missions (by war veterans losing their grip) to save a girl who may or may not want to be rescued. In The Searchers, it’s Natalie Wood with the Comanche Indians; and here it’s 12 year old Jodie Foster with her pimp, played by Harvey Keitel. Taxi Driver certainly takes on a different look today, than it did when it was first released. It was surely not endorsed by the New York Chamber of Commerce as we spend two hours in the filthiest, most crime-addled areas of the city. Of course, today, much of that same area is touristy and revenue-producing (in a legal way!). The campaigning by the slick politician and his idealistic supporters (Albert Brooks, Cybill Shepherd) ring as true today as then … kind of sad more progress hasn’t been made. This is a very tough film about one man’s slow descent from sanity caused by a seemingly impossible dream of cleaning up the streets of the city and the morals of its inhabitants. The isolation and alienation themes hold up well today, and though it may not be Scorcese’s absolute best, it could be DeNiro’s rawest performance. For a chuckle (you’ll need it after watching it), imagine the film directed by Brian DePalma (Scarface) and starring Dustin Hoffman … it almost happened! Next month’s showing is the underrated Hal Ashby/Robert Towne 1973 film The Last Detail, which features a 35 year old Jack Nicholson in full scene-chewing glory … one of my all-time favorites!